The first time I ever spent a night in the van I had a terrible sleep. Why? Simple rookie errors of a ill-prepared vehicle. I had no curtains installed to block out nearby street lights, only had a inflatable camping mattress on the floor, and, to make matters worse, I was sleeping on a slight decline without realising. 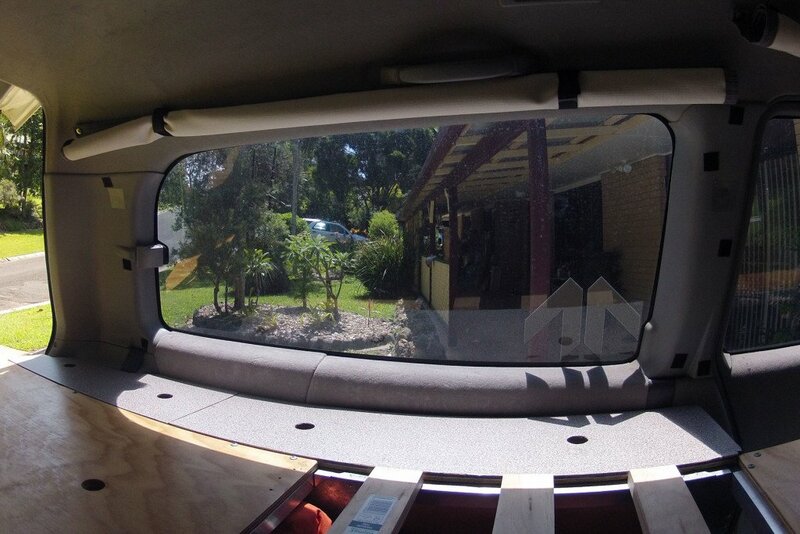 Good quality, blockout curtains are a must-have item for any vehicle than you will be sleeping in; whether it’s a campervan you will be travelling in for many months, or just a wagon that you occasionally use for overnight jaunts when you’ve partied too hard and don’t want to drive home, have driven down to a surf spot the night before, or are at a music festival etc. Curtains help to reduce light and, to a lesser extent, noise from disturbing your sleep – especially if you’re stealth camping in an urban area with bright street lights nearby. Curtains also help provide privacy, avoid attention of residents/authorities when stealth camping, and also help reduce the amount of damaging sunlight and heat that is coming into your vehicle during summer months. Many campervans, motorhomes and standard passenger vans will come with preinstalled curtain rails along the side passenger windows. These are fine for basic use, however they’re not always made from good quality blockout material and they rarely have pre-installed curtains on the rear window or behind the driver and passenger seats. Our Delica did not come with any curtains, so after my first experience we decided to come up with a solution that would block off as much external light as possible, but still be reasonably easy to roll up out of the way so we can see out of the side windows when driving and also so the Delica wouldn’t look too much like a campervan while in town. After a fair amount of research, design and testing, we decided that installing the curtains using self-tapping snap fasteners (they look like this and are bought from a hardware store, eBay or Amazon), double sided velcro, and adhesive velcro would be the best solution possible. The snap fasteners were used to semi-permanently secure the top of the curtains to the van’s roof for the four side windows and front two curtains, the double sided velcro was used to secure the curtain when rolled up, and the adhesive velcro was used to attach the sides and bottom of the curtain to the plastic interior trim around the window, as well as the rear, quick-remove curtain. We sewed on the adhesive and double-sided velcro sections to the curtain material after measuring and marking where it would be required. 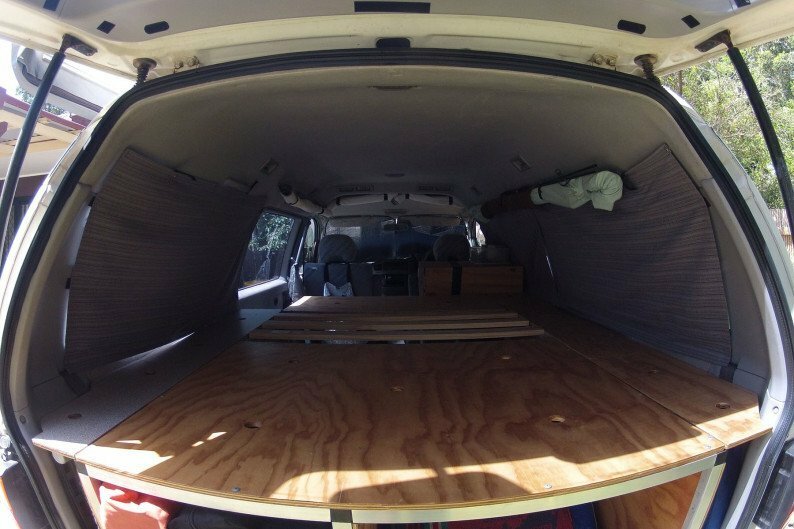 For the Delica in particular, due to various the contours of the interior, each blind was custom designed and measured up to fit each window properly so there weren’t any gaps and it looked neat and professional. This was a somewhat painstaking task of measuring, testing and adjusting as needed. All up it took about 8 hours of work from concept to final product, but most of this time was due to the trial and error nature of our project. If we did it again, and used a better quality sewing machine, it would only take a few hours. 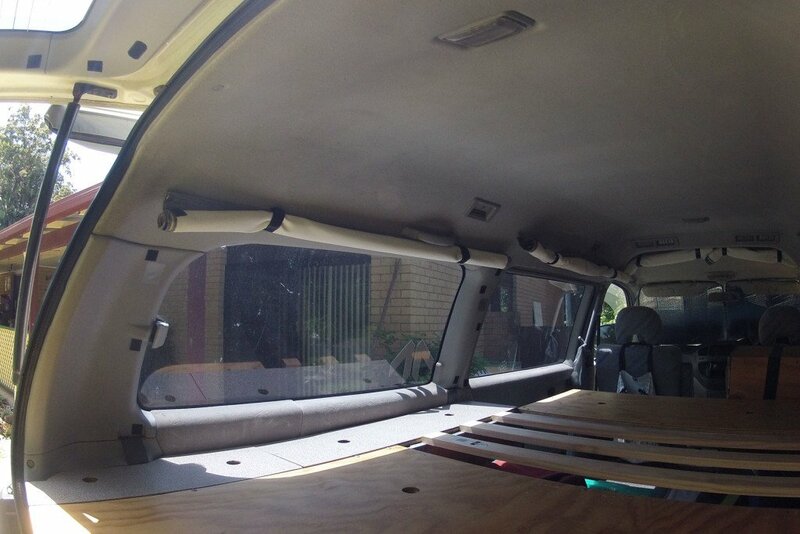 After having the curtains in the Delica for the past 11 months we are definitely happy with the results. The curtains have held up well and the only issues we had was some of the adhesive velcro falling off the rear window plastic trim due to poor surface preparation and heat. This was resolved by properly cleaning the surface with rubbing alcohol first, and warming up the adhesive backing before applying replacements. 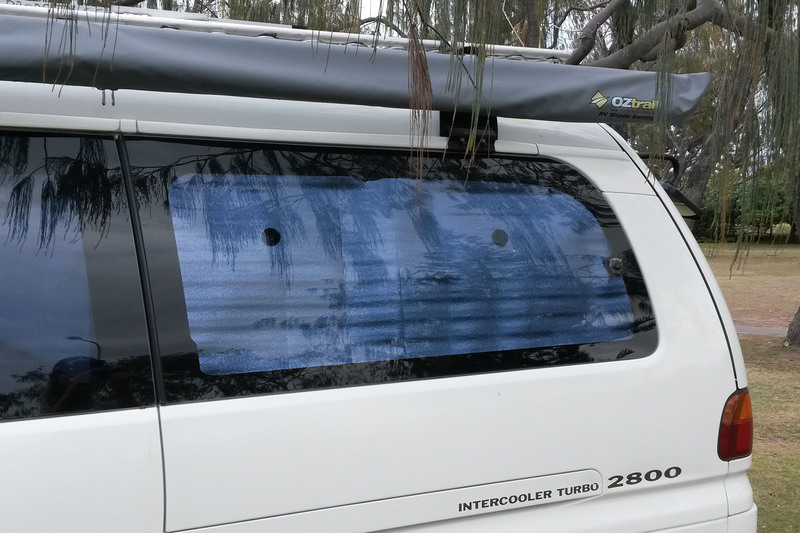 We also used a section of insulated reflective material for the rear passenger side window which is cut to the shape of the window and held in place with suction cups. This helps to protect our surfing equipment stored in this area from heat and sunlight during the hot summer months. It cost $5 and took 3 minutes to measure, cut to size and install. It’s not perfect, but it was cheap and it’s effective – that’s how we roll! Hi, I was wondering how the connect-it is hold up? I was thinking of using the same and I heard they are a bit wobbly. The plastic joiners hold up fine. The weight when laying on the platform creates pressure that keeps them in place. We’ve been using our folding system for over a year with no problems. The one bit of advice is to ensure the removable sections are always installed the same end and side, otherwise the aluminium tubing will eventually shave off the plastic connection too much and that will get wobbly then. I used a permanent marker pen and marked “this side up” and “face this way ->” on the three removable poles to ensure they’re always inserted the same way and they “key” into the matching plastic joiner if that makes sense? hi, I’m interested in your curtains ! 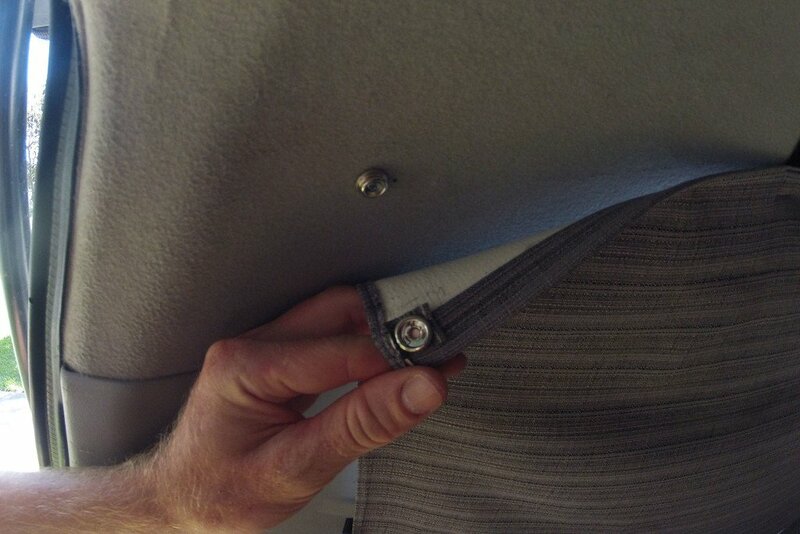 How did you attach the snap fasteners to the fabric in the ceiling of the van ? did you sew it in, or is there a way to use no-sew fasteners ? The ‘female’ head part of fastener that’s attached to the fabric is punched into the fabric using the tool that came with the bits. Simply punch a small hole in the desired area, place the head in that hole, and then punch it into place. We then sewed around the fastener head to reinforce it. However as we left the curtains up and rarely disconnected them it wasn’t an issue, and the weight was minimal. No tearing. Also we used quite heavy duty ‘blockout’ curtain fabric too, which was durable and easier to attach the fastener to. The self tapping snap fasteners are really handy though, we use them for lots of things to hold things in place as they are quite strong. Let me know if you have any other Qs. ​We made our black out curtains and it is working well! Great job! It’s amazing ho much time and effort goes into making something as simple as curtains isn’t it. I’m not sure if this website is still active but I’m very interested in whether you just screwed the snap fasteners into the plastic frame of the car or if you did something else to them. Hey there! i absolutely love these curtains. How much fabric did you need to use? From memory, around 1.6x6m due to the odd shape of the windows and we also had the dividing curtain between the cabin and the rear area. 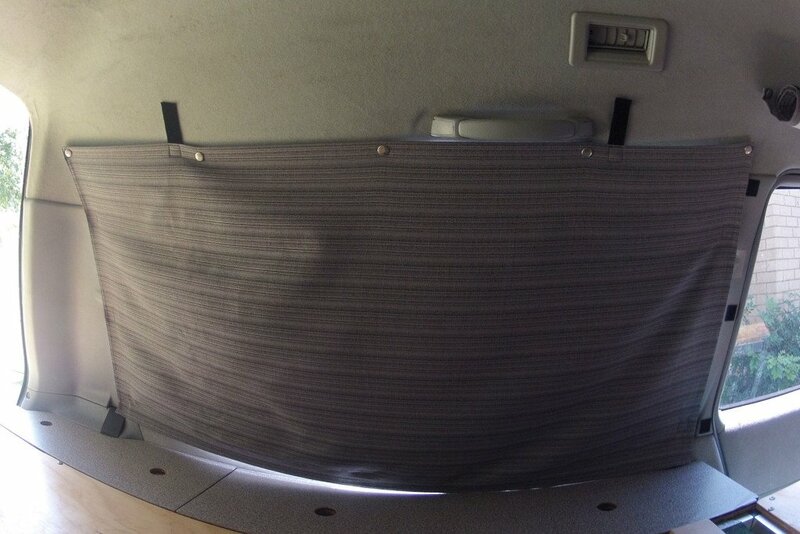 Our new van, a LWB Sprinter, now uses black/black blockout curtains on the dividing curtain and the rear windows. We have them side mounted rather than roll down style.